Escape everyday life with a holiday in the mountains and enjoy the lush colors of nature – the Alm Holiday awaits you in Salzburger Land. Hikers, mountain-bikers, ski-tourers, winter hikers and day-trippers are welcome here. 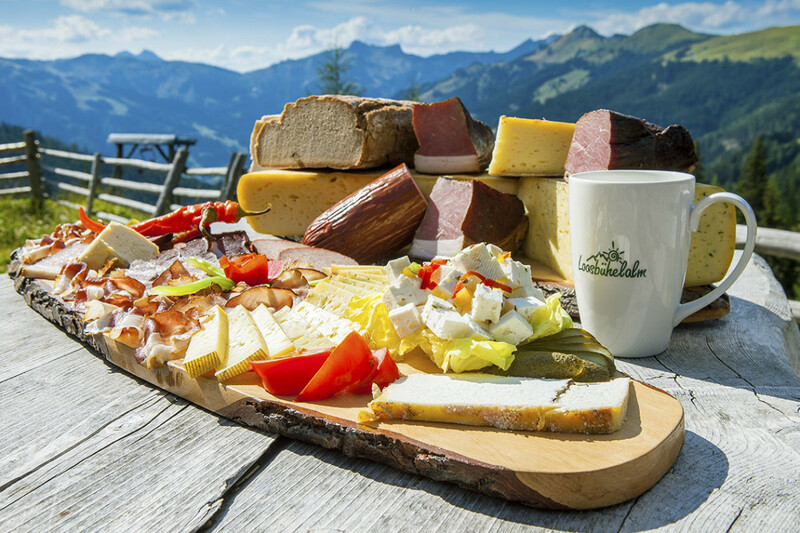 At Loosbühelalm in Ellmautal in Großarl at 1,769m above sea level, you can experience culinary delights in a special way. At our hut, we serve almost exclusively products that we produce ourselves at Klausbauer-Hof. Numerous events as well as easy access, even for people with disabilities, entice many guests to visit us up on the mountain. 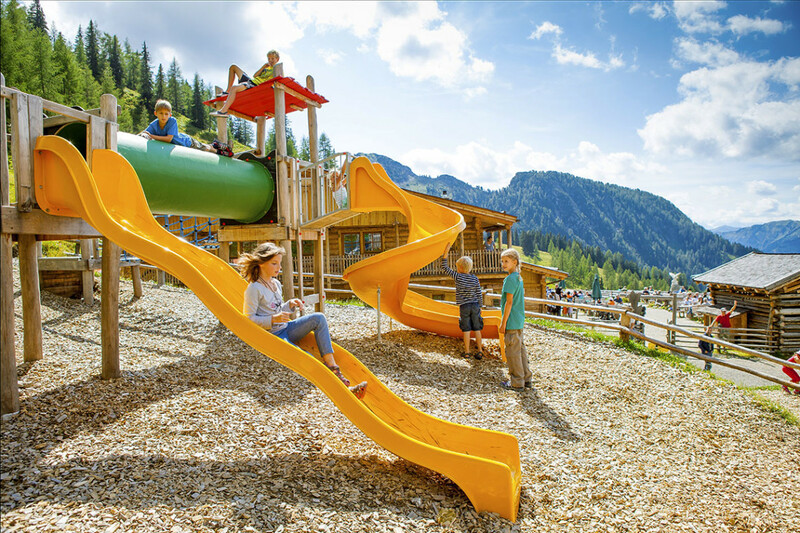 The large playground with petting zoo makes us a popular destination in Großarltal for kids as well. A special feature about our alm hut is the “Hutessen” (“hut meal”) (must be pre-ordered): a variety of meats and vegetables will be grilled directly at your table on a hot iron plate. In addition, you will receive a crispy salad and delicious sauces to accompany your meal. Quality is paramount to us here at Loosbühelalm. That is why we serve you, almost exclusively, with products from our own farm. Choose between various homemade cheeses. The cheeses taste twice as good when enjoyed with our fresh farmer’s bread and homemade alm butter. In addition to the typical “Almjause” (cold plate) you can enjoy small, warm meals as well. If ordered in advance, we will also gladly prepare Schweinsbraten (roast pork), Kasnock’n etc. 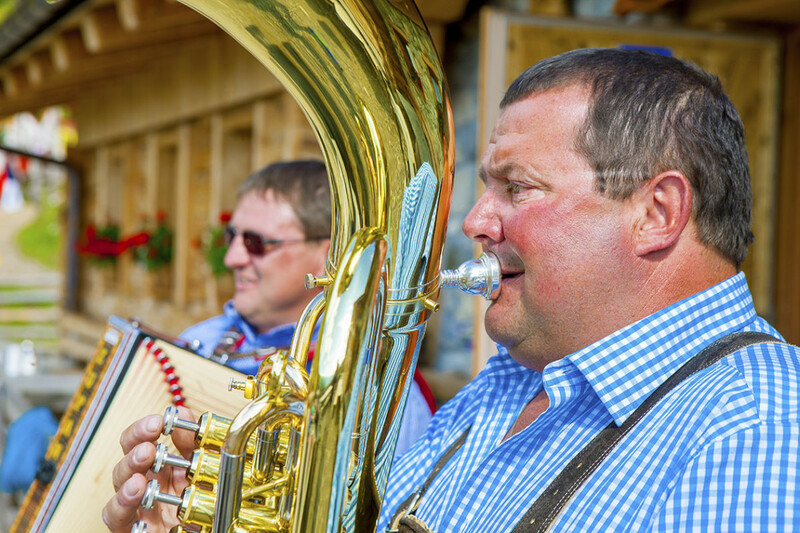 Throughout the year, you will find various fun events at Loosbühelalm, for example the Genuss-Cheese-Fest with a “Kasloab-Ziachn” Competition (Tug of War), the Großadler Music Day or the Genusshütten Almfest. Regional specialties, Austrian music and a great atmosphere up at Loosbühelalm in Großarltal – what more could you want? Various routes will bring you to Loosbühelalm in Großarl. Take a break from hiking to Gründegg, Draugstein or Tappenkarsee at the alm hut and recharge with our homemade products. 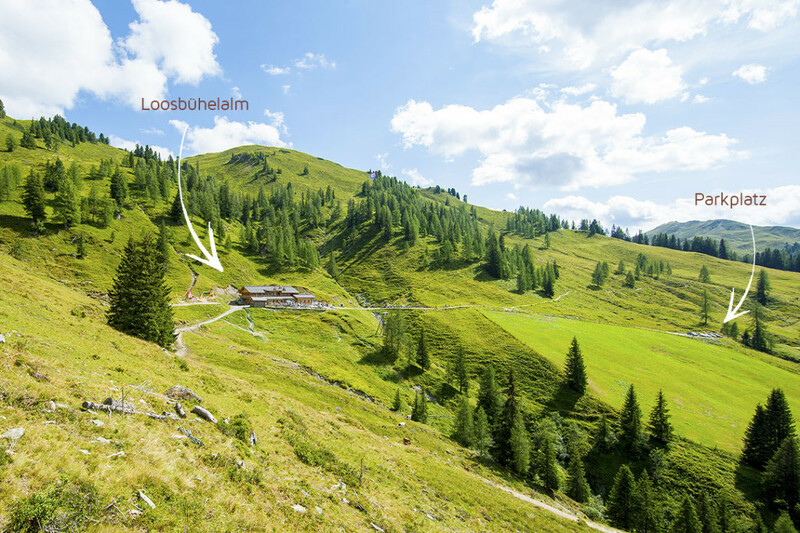 Discover the Salzburger Alpenweg trail, that goes directly by our mountain hut or hike up to the Tauernhöhenweg trail, which is ca. 30 minutes away from the alm. The road to the alm is an official mountain biking road. For older, injured or disabled guests, the alm is also accessible by car. The large adventure playground keeps even our youngest guests entertained! A play tower, swings, slides, climbing pyramid and a petting zoos invite the kids to play. Meanwhile, parents can enjoy some carefree time in the sun on the terrace in our comfortable sun chairs. The panorama over the entire valley, with lush meadows in summer and sparkling snow in winter, will make your holiday at the alm unforgettable! The Großarltal is a wonderful discover for model airplane pilots! 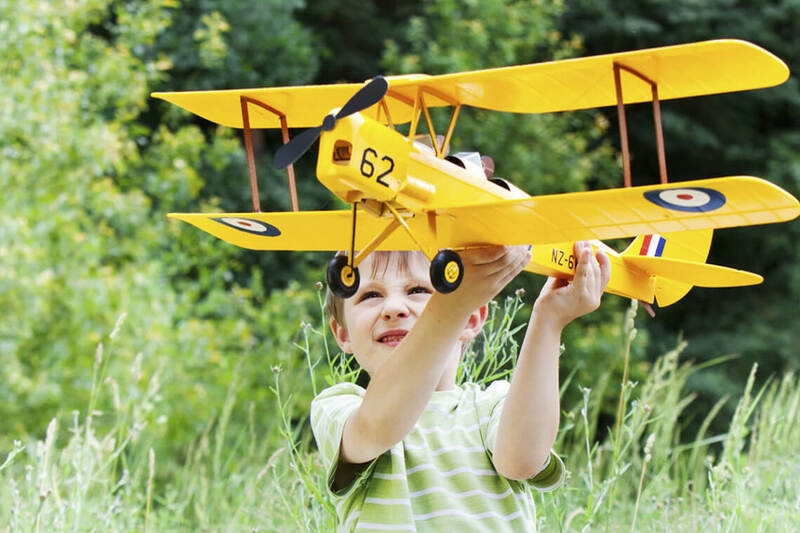 We welcome all pilots to our new model airfield and invite you, to enjoy a flight through the mountain air with your model airplane. Guests can drive up to 100 m in front of Loosbühelalm by car. 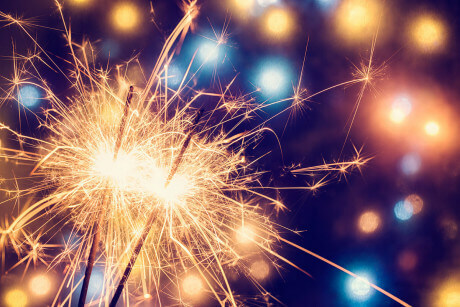 The road fee and flying license cost € 10,-, which we credit to you for later use at the alm!